Welcome to the latest post in our Closer series — a look at how technology brings couples, family, and close friends closer. 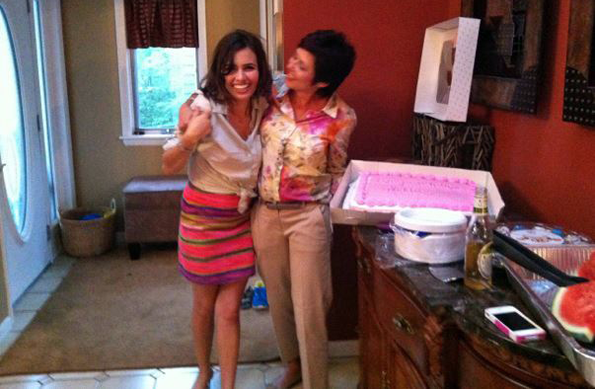 Leah and Maddie have an extremely close (and uniquely humorous) mother-daughter relationship. Having spent the majority of her life in close distance to her mom and family in New York, Maddie is now on her way to Virginia to begin law school in the fall. Maddie: Yeah, definitely cell phones. Leah: Well I don’t know about closer, but keeps us in touch. Maddie: Yeah, I mean I know when I was away, Skype really helped a lot and I suspect we’ll be using Skype a lot. Maddie: And FaceTime. We both got iPhones specifically so that we could FaceTime. At least that’s why I got it. What else mom? Oh, Facebook! Maddie: And we email. We email each other a lot. Maddie: Yeah, sales (both laugh) like, “You should check out this sale!” or things that we think are absolutely repulsive that the other should experience for themselves (both laugh again). It’s a good way to share visually when you’re not together. Unbucket: Tell us more about how you use Facebook to communicate. Maddie: We do mostly messages. Leah: I post on your wall, you just never respond! Maddie: Cause they’re usually things that are frightening or slightly offensive. Leah: When I post things about my Oreck vacuum and you don’t respond, it hurts. 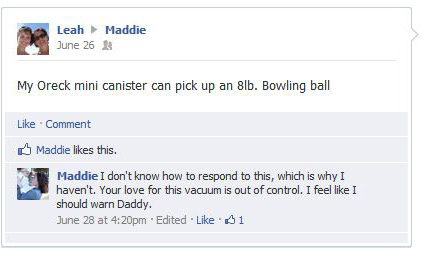 Maddie: Your passion for your vacuum is threatening your marriage. Leah: It can lift an eight-pound bowling ball. Maddie: Yeah, so can dad. Unbucket: Any additional thoughts on the technology you use to remain close? Leah: Maddie takes communicating to a whole new level. She’ll be upstairs and will call me on the phone when I’m right downstairs in the kitchen. Maddie: It’s true! I’m usually doing something and I have a question. Don’t take it out of context mom. Leah: I’m not, I’m just saying your generation is very dependent on technology. Maddie: Your generation is very vocal about not being dependent on technology, but you text me way more than I text you. Just saying. Unbucket: How do you see technology facilitating communication once Maddie moves away? Leah: I think Unbucket is a great tool. Being new to Unbucket, we haven’t fully explored it, but I think that we’ll use it a lot in this process. You can write paper lists down, you can send texts to each other but they get lost — Unbucket is just one site the two of us can go to check things off and add things to together. Maddie: We’re managing a to-do list together right now which is very, very cool. I’m excited to use Unbucket as an actual bucket list too for when I go to Virginia, as a to-do list of things I want to experience. I think it’s a wonderful way to communicate with friends and family members about things you want to accomplish together. Maddie: I don’t break into it! The only reason your calendar came on to my iPhone is because we’re both syncing with iCloud. It just showed up on my iPhone. Maddie: Because you saved it to a calendar that is saved to both of our phones. Leah: Okay, we’ll I’m not going to put my doctor appointments on Unbucket. Leah: In one way it brings us closer – I mean my parents, eighty years old, are on Facebook. That’s so cool. My dad reconnected with his camp friends from his childhood. On the other hand, I think that we’ve lost the art of face to face communication. I guess it has helped society as a whole because the lines of communication are there, but I think people are losing their ability to truly communicate. Maddie: I think that’s absolutely true. A book just came out called The Gaggle and it kind of purports that we live in a post-dating world, and it talks a lot about how technology has influenced that. Technology blurs the way we connect with each other, it blurs boundaries and it blurs categories. Leah: And it contributes to things taken out of context! Maddie: Right! I was just talking with someone how I am a very sarcastic person, and when you’re Facebook messaging or when you’re texting, sarcasm doesn’t really carry over. Maddie: Absolutely mom. Things can be totally taken out of context, which can cause issues as well. It can create in the midst of increased communication, miscommunication. Maddie: Gross exaggerations here! (More laughter) But at the same time, it really allows us to be much closer together when we’re far apart. It’s a funny paradox: When we’re together, it separates us, but when we’re separated, it brings us together. It will definitely make this transition a lot easier.